The Plaquemine Historic District encompasses 21 blocks of Railroad Avenue, Main, Eden, Church, Plaquemine, and Court Streets. 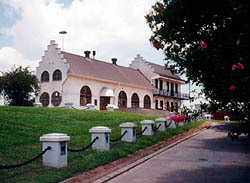 Incorporated in 1838, the town of Plaquemine developed as a commercial center due to its location on the Mississippi River at the mouth of Bayou Plaquemine. A lively steamboat trade built the town's fortunes, but this trade was partially disrupted in 1866 when severe flooding required that a dam be built to separate Bayou Plaquemine from the Mississippi. Although local civic leaders turned to the railroad to restore their commercial ties, they continued to campaign for waterway improvements until the Federal government opened the Plaquemine Lock in 1909. However, the decline in river traffic and the erosion of the West Bank of the Mississippi River turned Plaquemine towards the rail and the lock was closed permanently in 1961. Several "cave-ins," including a major one in 1888, plunged streets, businesses, and residences into the river. Today, as a result, most of the original town of Plaquemine is gone. The Plaquemine Historic District includes the few Greek Revival buildings that have survived the ravages of the river and time as well as the later commercial area which developed along portions of Railroad Avenue, Main and Eden Streets between the 1880s and 1930s. Also included are the residential neighborhoods, which grew between the railroad and the river as well as along the West End of Main Street. The community's fine late Italianate, Queen Anne Revival, and 20th-century eclectic buildings owe their existence to the coming of the railroad. The district contains two 18th-century French Neoclassical style buildings, St. John School on Main Street is an Italian Renaissance style school. St. John the Evangelist Catholic Church, also on Main Street, is a tour de force in the Italian Romanesque and early Christian styles. There are many other superior quality architectural examples in the district, including old City Hall, now the Iberville Museum, at 57735 Main Street. 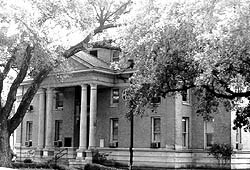 The City Hall has a four column pedimented portico, which makes it fairly unusual among Louisiana Greek Revival buildings. The Brusle Building at 23410 Eden Street stands as the finest commercial Italianate building in the parish. The Plaquemine Historic District is bounded by Railroad Ave., Main, Eden, Church, Plaquemine & Court Sts. in Plaquemine. Residences are private and not open to the public, but many of the businesses, institutions, and government buildings welcome visitors. Visit the Historic Plaquemine Lock, a State Historic Sites, is open 9:00am to 5:00pm daily, call 225-687-7158 or visit the state park's website for more information. The Iberville Parish Tourist Information Center, open 10:00am to 4:00pm Tuesday-Sunday, except major holidays, is located at. For group tours or further information call 225-687-5190, or visit the parish's website.